$12 per person — Book online today! We welcome you to discover Kaluanui on this walking tour featuring more than seventy specimens of plants and trees. About an hour in duration, this beautiful tour of the Kaluanui Estate celebrates Maui’s unique landscape and history. Built by Harry & Ethel Baldwin as a family home in 1917, Kaluanui now provides an inspiring and creative space for Hui No‘eau Visual Arts Center—a non-profit visual arts organization founded in 1934. As you explore the Kaluanui Estate, you will see two of Maui’s largest Norfolk Island Pines, many endemic and indigenous plants, the remains of one of Maui’s earliest sugar mills, and you'll also learn a bit about the architectural features of a nearly 100-year-old historical home. Along the way, you will also have the opportunity to see a live glassblowing demonstration (available on Mondays from 10am-1pm), peek inside the Hui's professional art studios, and shop a beautiful selection of Maui made gifts. Visit Kaluanui today to experience a living piece of Maui’s history! We invite you to visit us at Kaluanui any day of the week to view the current exhibition, see working art studios, discover Maui history, and walk around beautiful grounds of the Kaluanui Estate. You may also purchase our $6 guidebook Kaluanui: Plants at the Hui for a self-guided tour. With up to eight rotating fine art exhibitions each year, you’ll be sure to view some outstanding work created by Maui, Hawai‘i, and beyond! With many of the exhibited works available for purchase, you might even find a perfect piece to add to your collection. Please check gallery schedule on exhibitions page to find out more about the current show on view. We invite you to join us and shop Maui & Hui Handmade! Visitors and Maui locals rave about The Gallery Shop at Kaluanui! With beautiful, fun, whimsical, and skillfully crafted handmade items for any occasion, you’ll be sure to find that one-of-a-kind gift or souvenir for family and friends! The Gallery Shop at Kaluanui is filled with handmade items from over 75 local artisans and unique museum quality gifts. All purchases help support the Hui and local artists. Many of the items are made in the Hui’s very own jewelry, ceramics, printmaking, and glassblowing studios! Stop by today, shop for the perfect unique gift, and support our talented local arts community! In this exhibition, you'll see the original artwork of Ethel Baldwin! 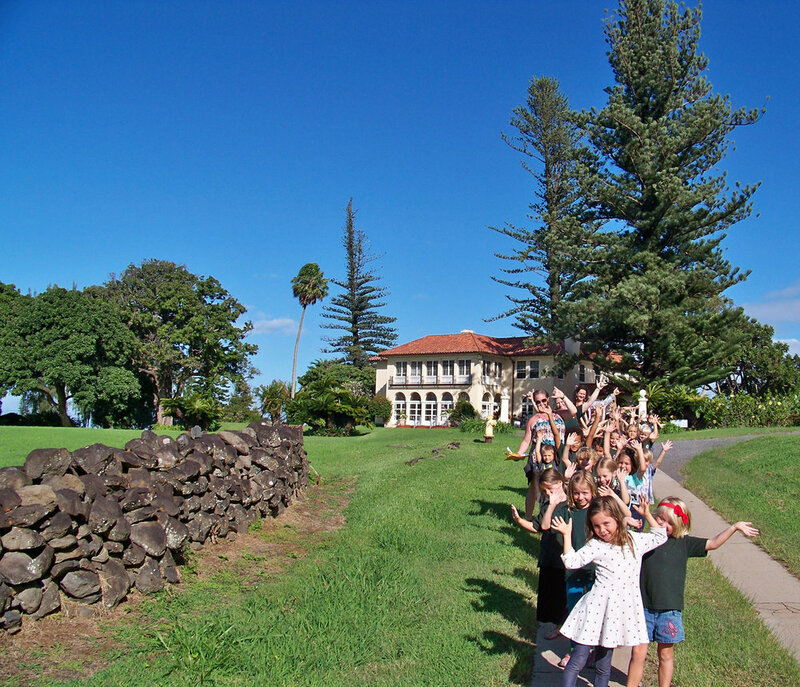 Kaluanui was built as a family home for Ethel Baldwin and her husband Harry in 1917. In 1934, Ethel Baldwin, her daughter Frances Baldwin Cameron, and a group of 20 friends gathered together to form Hui No‘eau as a way to celebrate their love of the visual arts. We invite you to get to know our founder through her artwork lovingly displayed in honor of Kaluanui's centennial year. Come meet Teaching Artist Stephen Fellerman and watch as he works in the Hui’s new glassblowing studio. You’ll be amazed at what he can create! Purchase one of his pieces or sign up for a class to make one of your own.